Today at the EPS Conference on High Energy Physics in Venice, the LHCb experiment at CERN's Large Hadron Collider has reported the observation of Ξcc++ (Xicc++) a new particle containing two charm quarks and one up quark. 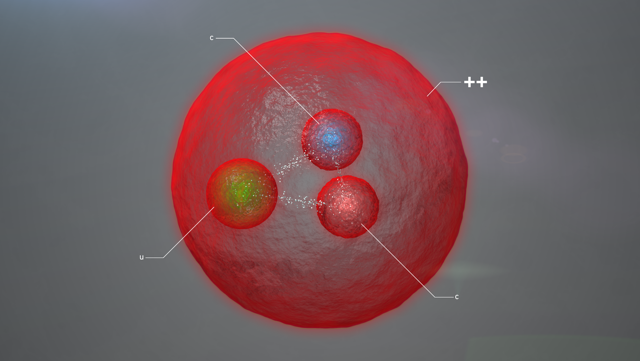 The existence of this particle from the baryon family was expected by current theories, but physicists have been looking for such baryons with two heavy quarks for many years. The mass of the newly identified particle is about 3621 MeV, which is almost four times heavier than the most familiar baryon, the proton, a property that arises from its doubly charmed quark content. It is the first time that such a particle has been unambiguously detected. "Finding a doubly heavy-quark baryon is of great interest as it will provide a unique tool to further probe quantum chromodynamics, the theory that describes the strong interaction, one of the four fundamental forces," said Giovanni Passaleva, new Spokesperson of the LHCb collaboration. "Such particles will thus help us improve the predictive power of our theories." "In contrast to other baryons, in which the three quarks perform an elaborate dance around each other, a doubly heavy baryon is expected to act like a planetary system, where the two heavy quarks play the role of heavy stars orbiting one around the other, with the lighter quark orbiting around this binary system," added Guy Wilkinson, former Spokesperson of the collaboration. I would have guessed that at some point people would go "Wait a second. there seems to be a pattern, here. Maybe just because I don't know how to use this doesn't mean that someone much smarter than me won't know how to use this in the future to create something awesome"
"Whereas many way more useful findings are already waiting for its recognition for decades (cold fusion, overunity, antigravity)"
exactly! I use antigravity every day to go to work and it still doesn t have a REAL recognition!!! this is a disgrace! And the replicator gets another step closer..
More BS, a theory without a theory, only misinterpreted observation. As someone who did this kind of research in the past, I will admit the direct results of this research are probably not particularly relevant for future technology. Not all research NEEDS to end in a product that can be sold. 1) There's a human desire to have a story about how this world is, from the perspective of things that anyone (with the right tools, at least) can observe equally. 2) The people who do this research, especially grad students who do a lot of the heavy lifting, don't always stay in the field. They learn how to understand data and analyze it and other strong skills, and then go take those skills out to jobs that are selling products and improve the product being sold with the skills they learned finding this particle. Also, yes just finding an excited state of a known particle, while interesting in our community, maybe doesn't need a layperson article trying to hype it. @shavera, don't always need an immediate application to have a useful piece of information downstream. Finishing the documentation of various expected results, to actually confirm they happen the way we expect, is important to confirm or deny the theories that generated these expectations. We regularly find results that we didn't expect when we do this and our theories are informed and improved by these results. In a few cases, we find that we were wrong and have to go back and modify the theory. This is "small but important science." And occasionally revolutionary. @Dingbone, scientists aren't interchangeable parts. I wasn't interested in biology so I wouldn't have gotten very far being forced to do biological work, even if it 'made life better.' It's not like you can kick all the particle physicists out of a job and tell them to go cure cancer. If you must view it in such terms, there is a degree of a 'market' about such things. Grad schools can only accept so many students for certain types of research, and that number is often dependent upon how much grant money they can argue for; which is, in turn, often dependent upon the 'value' of the research results. But again, I also remind that just because a scientist is doing a 'pet project' now, doesn't mean that's the only thing they'll do in their entire lives. All the scientists at Los Alamos may have some 'pet project' but they're also doing research to keep our nuclear arsenal up to date and safe. Grad students go out into industry to make things, and so on. Interesting comments, versus knowing what one is doing, creating software experiments based on known physics. This is scary and nonsensical. The final event, given enough power, breaks through your containment field, time of exposure, the largest nuclear blast ever recorded, watch normal matter fission! Hunting events? @Dingbone, scientists aren't interchangeable parts. But...but....but..Hollywood? they tell us you just have to slap the word 'scientist' on someone and suddenly they can du anything! Charge does not have mass! You can't just redefine a word and then expect everyone to mean your own unique meaning of the word. Charge does not, itself, have mass, you are right. It is simply a value that describes how strongly a particular particle couples to the electromagnetic field. But all your other redefinitions of it have no meaning in terms of physics or otherwise. I do encourage you to actually learn what these terms mean within the field (of physics), how they work within the field, before going about trying to tell us you've overthrown the field you don't presently know. There's your error, you don't know what charge is? No, no overthrow, I'm just throwing away your nonsense. Nothing new here. Forget the 20th century except for Maxwell, juz say'n by the way, wiki... is incomplete, where does the field originate? @Hyper, charge is that quality of type unknown in certain particles that creates a field. It falls off at the square of the distance, so at any macroscopic distance the effect of a single electric charge cannot be measured. If you're talking about distances greater than nanometers, the E field generated by a single electric charge is essentially zero as far as measuring it or seeing any discernible effects goes. For color charge the distance is more like femtometers or less; for weak charge it's about the same as electric charge or a bit less; and for gravity it's more like millimeters. And BTW Maxwell is 19th century physics. On Earth. And there's no theory involved in that; it's the outcome of experiment. There is nowhere to hide. Keep it up guys, nice debate on what was, is and might be useful. Gosh, how many of us have had given us some apparent 'useless' gift only to think later 'hey, I've got that thingummy that whatshisname gave me in the attic/hut (etc) that might just do the job.' Yes, I know, the quantum realm isn't quite like that but it adds to our knowledge and such knowledge might be useful say in 100, 200 years or whenever when someone develops some super fast recycling plasma flying machine (whatever that is, Ha!) or when some biologist finds it could be the reason why DNA mutates to produce new species. We live in exciting times so be thankful that we can stetch the limits of our knowledge. nikola: The quarks that make up a proton each have a mass around of around 3 MeV/c². A proton has a mass of about 940 MeV/c². It takes energy to bind those quarks together, and as such, the overwhelming bulk of the mass of a proton is that binding energy. These particles have 2 charm quarks and an up quark. A Charm quark has a mass of 1290 MeV/c². So even just in terms of their isolated rest masses, we're already looking at 2600 MeV/c² in mass. And if it was around 900 MeV/c² in binding energy to hold a proton together, when we add that to the 2600 above, we get 3500 MeV/c² in binding energy, which... I'd say is a pretty fair match for the measured 3621 given in the article. Frankly you'd have to be quite the UNreasonable person not to see the result as fairly plausible. I mean it's simple addition. No crazy calculus or anything. Also, a proton has many many more than 3 gluons. They have, functionally speaking, infinite numbers of gluons. (they also have, functionally speaking, many more quark-antiquark pairs known as 'sea quarks', but that's in a very technical sense). Yes, so if we talk about these 'sea quarks' within the proton, some of those quark-antiquark pairs will be strange/anti, charm/anti, bottom/anti, top/anti. They're not "on shell" quarks (meaning that while they exist in *some way* they don't have the full energy to truly exist), but if something collides with one of these "off shell" quark pairs, and gives them enough energy to truly exist, and kick them out of the proton (or other particle), then you can observe their exit. Why aren't they produced in nature? They probably are around, like, black holes, but no non-human processes on Earth possess enough energy to create them. why spin occurs in each particle. Already an answered question. Doing the relevant quantum mechanics and including relativity will show how spin arises. Already an answered question. There is an electromagnetic field throughout all of space. A field is not a thing or a substance or a fluid. It is simply that at every point in space, you can, in principle measure some numbers that describe the behaviour of a charged particle at that point. The way that this electromagnetic field generates non-zero values is that there are particles with an associated 'electric' charge that may be in motion; and, again including relativity of that motion, mean that the field around them has electric and magnetic components. Those components, in turn may form 'waves' as they vary over space and time. I know it's hard to believe without actually doing the work of _learning_ the answers to your questions. But if you do actually spend the time to learn the field before you criticize it like a blind man, maybe you would be able to actually ask questions that are serious criticisms or truly outstanding questions that remain unanswered in it. There only exist a + and a - charge. They have no mass. The center moves with respect to the field. Charge is the field, charge is the entire field. There is no assembly required. It's self assembly. You only measure changes in the fields. When moving particles around, the created becomes a creator! You have no idea whether you are measuring something, or creating and unknown combination of charges. The danger is allowing a child, without knowledge, muddle with atomic devices. The universe trying to define itself! Maybe, those signals from space, i.e. unknown sequence, knows better than you. Wonder if they are as aggressive as you. i.e. trying to define yourself as intelligent! No, I doubt that our mentality could reach their level! We're too persnickety and stupid! Your idea of the universe cannot change the fact that our gravitational mass [ an unknown, a constant, a placeholder until someone answers Newton! What's the source of this field, it's within all matter? ],mass contains bipolar entities that exist from their centers to infinity! Get it? Stop trying to fit reality to nonsense! There's nothing else, never created or destroyed, occupies all space. Axiom! duh Empty space is only conceptual, there is only a set of charges, apparently an infinite set. The speed of light is its original wavelet's length, created by charge motion, careful with transforms from time to frequency,divide by the measured period recall the time varying, single reflects actual motion! Thus we define truth, else prove me wrong! A field does not affect another field. A charge within a field creates a field wrinkle, i.e. each charge or the fields are interacting, we measure the motion of the centers, correct? We only measure the wrinkles? What about the rest of the field? Missing mass? Dark matter? Think! Of course QM is useful when your instrumentation and computation are limited. You're simply expressing phonons as wavelets, i.e. all events created by all the possible wavelets. It overstates reality! The waves are definitive and causal, therefore dropping QM for computation of actuality is my suggestion. Do you accept the illogical conclusion of science that there is an empty space? All those who believe in it, their brain is emptied of a consciousness with which they can find out many things. Did you realize that the universe is filled with ether, which science ignores, also ignoring the existence of the Spiritual Entity of the universe. I do not intend to convince anyone to accept what I propose. But it is very symptomatic in the whole science that it is always claimed that something has been proven, and later it is established that there is nothing of it. But, think about what is gravity and magnetism, and you will be orientated on the right path. And dark matter is ether. Dark energy is what can not be measured by what science has, but it is real energy. The universe trying to explain itself, "nothing" is only conceptual! Nice strawman, but no, I don't complain about people playing around unless all they are doing is playing around. You on the other hand seem to idolize those who "play around", never having to produce definitive, tangible results or actually prove any of the things they theorize. Yes, pretty much every time you post. You confuse science with engineering. You are part of the massive field of charges, nothing else. You are trying to explain, what? You are part of the massive field of charges, nothing else. What does this even mean? Charges don't have mass. Some massive particles have charges. Some do not. Charge is defined by the vacuum, and has no mass. In fact, physical experiments show that even extremely massive particles have no more electric charge than the least massive particles; it comes in units of the Avogadro constant, one two or even three of these minuscule charges being equivalent to the power of a kitchen match compared to a hydrogen bomb. Either you are confounding philosophy with physics, or you are obscuring physics with philosophy. Either way, to anyone who knows physics, you are dead wrong. Get over it. @Da Schneib Reading 'hyper's' other comments it's almost as if hyper is mixing QFT with a kind of pseudo-Aether Wave concoction???? @Mimath, i haven't been able to make sense of @Hyper's maunderings. They seem to be a mashup of various discredited physics and misunderstantings of real theories. I usually don't bother responding except for amusement. We should not easily dismiss interactions in the ultra-small scale, for these could well be the most energetic of all when scaled up in mass processes. Consider the fissioin cascade which involved the nucleus as many magnitudes more energetic than the chemical reactions that we knew about before. Then fusion that involved particles in the nucleus liberated still higher energy states. As a child, a man named Hahn proposed a laser with a native wavelength half a nuclear effective statistical diameter could disrupt any such diametered nucleus that the beam hit..... a disintegrator beam with tremendous explosive effect. Now comes theorists with yet another layer of the matter onion, the prions, complete with fractional electrical charges. Here we now have charmed matter, so what properties will elements built from these have. What new physical force will be discovered. The future of physics is more exciting by the day. We will yet find a UFO drive. He who knows not and knows that he knows not, is a student. I respect that. First know what is being taught; then, without parroting what you just learned, show it's flaws, logically. Any Other comment is not knowledge. Show respect. You are not teaching, using something you heard; it must be something no one seems to know! I think the issue is practical science and control is engineering; therefore, engineering is above science. Today, everything measured requires engineering and scientific knowhow. Any fool can misinterpret results. WTF? "Proving a theory is engineering is it? Apparently I am not the one who is confused...."
Every proof requires logic, there is no proof with an ignorant search. You think it's marvelous; but, it is fancy! Yes you are confused! Physicist at CERN are defining a charge weapon! You are being handed nonsense as a screen. My issue is stay away from NOBEL, it's screwing science!